Looking for a warm-up for the World Cup in Brazil? ¡Vamos! should do the trick. The North East celebration of Spanish and Portuguese-speaking cultures always turns up the heat... and Portuguese, of course, is the language of Brazil. The festival, nine years old this year, has become a fixture on the North East calendar. Perhaps you wouldn’t have bet much on its staying power when it was conceived. The North East, you might have thought, traditionally looks to northern Europe and Scandinavia rather than the lands of sombreros, tapas and flamenco. But Nik Barrera – ¡Vamos! co-director with Patricia Oliart and Sara Lourenco – says the festival, which made its debut in 2006, has brought together all sorts of people with different reasons to thrill to the sound of a Latin American beat, whether musical, literary or otherwise. They are immigrants, descendants of immigrants, academics and, increasingly, people who have developed a passion for the vibrant cultures of the countries – European or South or Central American – which fall under the ¡Vamos! linguistic parasol. To enjoy the festival or participate in it you don’t have to speak Spanish or Portuguese. Knowing that ¡olá! and ¡hola! mean hello should be enough. Nik reminds me that he has a personal interest because of his Colombian father, whom he grew up not knowing. The official language of Colombia is Spanish. Nik, who came to the North East from Bristol to study art at Northumbria University, made his curiosity and yearning for a country and a culture he didn’t properly know the subject of his degree show. After graduating, he stayed in the region. Through ¡Vamos! he has drawn together a community of people who share his fascination for places far away and has caused their number to grow. The festival has extraordinarily broad appeal, as was clear at the launch on a grey Newcastle Quayside when Brazilian dancers wearing little more than their mardi gras feathers gamely managed not to shiver. “I’ve always been passionate about the visual arts but the festival brings lots of different art forms together,” says Nik. Nik says support for the festival has always been keen. 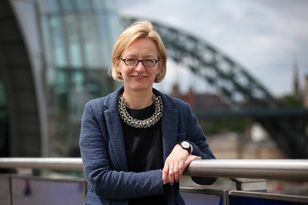 Key partners such as Newcastle University and Arts Council England have stayed faithful to the concept and it has wooed some substantial audiences. “We come across a lot of people who say they come to ¡Vamos! but don’t necessarily go to other cultural events in the region, so I believe people have developed a sense of ownership of the festival,” says Nik. “I think we are changing as a nation, too. Even if the Latin American proportion of the population is still relatively small, we’re becoming more multi-cultural and a Latin American festival in the North East, while still being quite exotic, can also be inclusive at the same time.” With his particular interest in the visual arts, Nik secured Arts Council funding to commission Brazilian artist Flavio Morais to make a special ¡Vamos! pavilion. This will appear at various locations during the festival – for instance, outside Northern Stage to meet the opening Mardi Gras parade on June 7 – but will then also be used to take festival highlights around the country. Touring ¡Vamos! is one of Nik’s aims, along with making it a year-round brand. Among the many attractions of this year’s festival are film screenings at Side Cinema, a Cubano-inspired pop-up restaurant at Newcastle College’s Lifestyle Academy, lunchtime concerts by Young Sinfonia at Sage Gateshead and a Miró exhibition at the Balman Gallery in Corbridge. A Mardi Gras procession featuring musicians, dancers and children from eight Newcastle schools will parade up Northumberland Street at noon on June 7, culminating in a performance on the lawn outside Northern Stage and heralding an afternoon of free activities. In the evening at the Mill Volvo Tyne Theatre there will be a performance by Jaleo Flamenco from Seville. In Middlesbrough, a new commission by artists Eli Sudbrack and Christophe Hamaide-Pierson, who form avaf, will open on June 5 at mima and be on display until June 22. Get along to Summerhill Bowling Club, Winchester Terrace, Newcastle, for an evening screening of Tie Me Up, Tie Me Down by cult Spanish film-maker Pedro Almodóvar on June 13 and a free family picnic on the 14th with lots of music, dancing and children’s activities. Attractions include award-winning Afro-Brazilian band De Lata and Element Dance Company. On the 15th, Radio Revellers will present The Blade of Xorro at the bowling club – laughs and slapstick aplenty – and Portuguese Day will be marked with an event at Bar Loco, Leazes Park Road, when Newcastle University will also celebrate 50 years of teaching Portuguese. The broad scope of ¡Vamos! allows for a major literary conference on June 20-21 at Great North Museum: Hancock and Mexican wrestling on June 21 at the Toffee Factory, Newcastle Quayside. The conference will look at forms of storytelling in the Spanish- and Portuguese-speaking worlds and speakers will include Peruvian writer, journalist and radio producer Daniel Alarcón, Basque graphic novelist Javier de Isusi and Gabriela Wiener, chief editor of Marie Claire in Spain. The festival will end with a free beach party at Crusoes cafe in Tynemouth, on the 22nd.